April 15 marks the 100th anniversary of the sinking of the RMS Titanic. Today the wreckage is being explored by Russian deep-sea researchers. 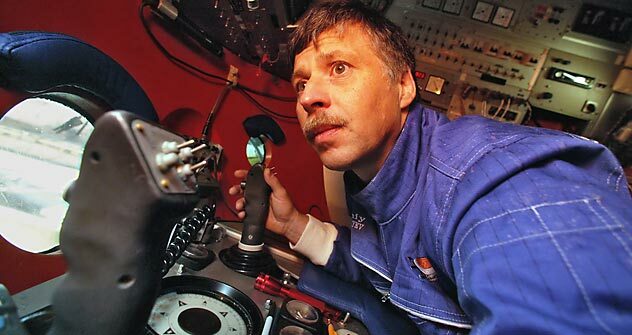 Evgeny Chernyaev completed more than 30 expeditions to the wreck during the mid-1990s. Source: ITAR-TASS, Reuters / Vostock-Photo Corbis/Foro S.A.
For 100 years, the rusty wreckage of the fabled luxury ship has been lying on the bottom of the sea. Now, thanks to Russian technology, we know what it looks like down there. Evgeny Chernyaev is very much the picture of a distinguished “hero of Russia”: a man with stony features, upright posture, gray streaks in his mustache, and with a large Russian flag emblazoned on his jacket sleeve. But all that changes when he dives into a sea of thought – or the world of the deep. When he begins to talk about his adventures under the sea, the face of the 57-year-old takes on a boyish appearance as the words pour forth. Chernyaev tells of bronze lamps that still shine after decades under the ocean, bottles that are still corked, and ornately carved wooden columns. he is speaking of the ship that has captured the imagination and enthusiasm of people like no other ship in history: the Titanic. April 15 marks the centenary of its tragic sinking. Probably nobody else knows the wreckage, lying on the bottom of the Atlantic Ocean nearly 12,500 feet below the surface of the sea, as well as Chernyaev. As the pilot of the Russian research submersible Mir 2, Chernyaev has made eight expeditions to the Titanic, for a total of about 1,000 hours of diving time. Chernyaev says he never dreamed of playing a role in the history of the Titanic; but he happened to be in the right place at the right time. The Titanic expedition. Source: ITAR-TASS, AFP / East-News, Corbis / Foto S.A.
On May 10, 1991 the Russian research vessel Akademic Mstislav Keldysh set out to sea from Kaliningrad. On board were the two Mirs and an international crew, among them Chernyaev. The situation in Russia and at the Shirshov Institute was not exactly rosy in 1991. The country was in a state of upheaval and the economy had collapsed. Under such circumstances, the sea researchers were worried about mere survival; they couldn’t begin to think about the future. The pilots of the Mir had almost no experience with expeditions at this depth, and the weather over the Atlantic was looking unfavorable. Yet any storms were all but forgotten when the two Mir boats finally reached the wreckage of the Titanic for the first time. Chernyaev, who was forced to share his small seat with the IMAX camera and two members of the camera crew, had to contort his body to even reach the steering wheel. He had seen numerous wreckages before and after the Titanic. He has seen the “Bismarck” and has dived to the ocean bottom at the North Pole. But even more than 20 years later, the recollection of seeing the skeleton of the Titanic suddenly appearing out of the dark still leaves him speechless. His mind fills with a flood of thoughts that he can hardly put into words. He says he thought how this massive ship must have flown over the ocean, of the courageous men and women who worked on board, and of the tragedy of its sinking. Chernyaev could see rusty railings, silver coins, and perfectly intact dinnerware. “Water is my element, and every expedition is like a fairy tale.” The tale of the Titanic is his favorite. Perhaps it was a happy ending to the story that only a few years later, American director James Cameron set out with the crews of the two Mirs to shoot the film classic “Titanic.” The crew spent up to 18 hours under water; the descent and ascent alone took five hours to complete. Again and again the director wanted to repeat the complex tracking shots for a second or third time. Each dive was first rehearsed down to the millimeter on a model contained in a tent on the deck of the Keldysh. To simulate the murky waters, the tent was filled with smoke. Even later Cameron remained devoted to the Russian deep-sea world. In 2010 he went on an expedition with Mir 1 to the floor of Lake Baikal. His most recent expedition, just a few days ago, took him to the deepest part of the ocean, the Marianna Trench – 50 years after the Swiss researcher Jacques Piccard was there for the last time. The Russian premiere of Cameron’s “Titanic” took place in Kaliningrad, the home port of the Akademik Mstislav Keldysh. Evgeny Chernayev thoroughly enjoyed the film.